Saving money is tough – and no matter how easily it seems to flow to some people, the fact is, you can’t underestimate human nature. What you can do, however, is rethink things, re-prioritize your material goals and recognize that it’s going to be a challenging effort that will surely reap huge rewards along the way. We went straight to the experts for their tips on how to save money without it feeling like an overwhelming burden. According to a recent CNN Money poll, 28% of us have no money put back for emergencies and half of us don’t have three months of expenses squirreled away, either. Take back the reins – even if you’re taking baby steps to meet those goals. It’s no secret, of course, that our credit cards can be a huge drain on our monetary objectives. Now’s the time to take a long hard look at just how much your Visa or MasterCard is costing each month. Once you’ve done that, those drains can be easily plugged. First, if you’re paying late each month, remedy that immediately. Those late fees add up and in a year’s time, you could easily have spent hundreds in just late fees. Also, paying down your balance means you’re paying less on interest. Speaking of interest rates, contact your credit card company and ask for a lower rate – and treat it like a negotiation. The fact is, there is so much competition in the credit card sector, you stand a great chance at getting that rate lowered quickly – and usually with just one phone call. We often like to test things out before we pass them on to our readers; after all, if what we’re writing about doesn’t work in our own lives, odds are, it’s not going to work in yours either. To do that, we asked a couple of our staff members to keep track of every penny they spent in just one day. The goal was to see if all of those expert tips to “skip the morning latte” really meant saving money each week. Here’s what our staff discovered. I keep those in the house for the kids. I don’t why I didn’t think of that sooner. Not only that, but I only pay about $3 at the grocery store for a whole box! Instead of running to the closest pharmacy, where Tylenol is higher priced, she said she could get it cheaper at the local Wal Mart. As for lunch, she said she never even realized how that added up. “My tuna sandwiches at home are better than the ones I pay ten bucks for”. Clearly, she’d found a way to turn that $20+ each week into money she could hold on to. The question is – how much are you paying for soft drinks at the convenience store that you already have at home? Put that $100 into your savings each week, pay down your credit cards, put it into a “mad money” jar to inspire your children to save – there are many ways to better spend that money. There’s a reason we’re seeing an explosion of online deal sites and coupon sites. Yes, some of them are frustratingly difficult to understand, but finding a few great sites can equate to big savings. Those online coupon codes can mean you never pay for shipping or perhaps those $100 sneakers for your up and coming rock star son can be found on one of those sites at half the price. Do a bit of research, find the ones that best suit your needs and then enjoy the savings. Fair warning: Don’t get so wrapped up in the savings that you’re buying those bowls for a few dollars when you have no need for another bowl in your kitchen. Remember – if you’re using your credit cards versus your debit card for your online deals, you’re going to be paying interest on the balance you’re trying to pay down. Make sure it’s worth it and avoid the frivolous temptations. Remember, this isn’t an overnight process. In some instances, like Penny discovered, you can see immediate shifts. Just don’t forget you’re trying to break habits and mindsets you’ve probably had for years – you may even have been raised with those habits. It might be hard work, but don’t lose sight of the end result. Keep your focus, set your milestones and then prioritize your changes. And if you stumble, it’s not the end of the world. Pick up the pieces, move forward and don’t look back. You can change your money habits if you are willing to recognize to do the work. 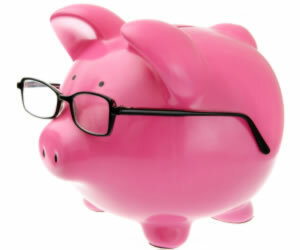 Do you have any habits that cut into your savings goals? How do you find ways to save as much as you can? Visit our Facebook page, join the discussion and let us know. And while you’re at it, be sure to follow us on Twitter too. You’ll be the first to know about great reviews, savings opportunities and new financial trends.